AMERICA’S largest city next year will stage the world’s largest fair, a $150,000,000 exposition costing about three times as much as Chicago’s famed Century of Progress. In addition to costing three times as much, the New York fair will be three times as big as the Chicago fair. The Century of Progress covered 424 acres. The New York World’s Fair of 1939 will extend over 1,216 acres. In fact, New Yorkers point out happily, if Chicago’s Columbian Exposition and Century of Progress were combined, both of them together would not be as large in area or as costly as the fair New York is planning. And whereas the Century of Progress attracted about 38,650,-000 visitors in two seasons, New York expects to entertain 50,000,000 visitors in six months. Building the world of tomorrow will be the New York fair’s central theme and when it opens next April 30, just 150 years after the inauguration of George Washington in New York City as our first president, it will present an example of man-made magic as amazing as the blooming of a lily out of the mire. For Flushing Meadow Park, the exposition site on Long Island, was formerly a city dump and this fair is rising out of a mountain of ashes to demonstrate how the tools and processes and knowledge of today can be used to create a better world tomorrow. The theme center of the exposition and the dominant architectural feature is to be a white globe 200 feet high seemingly poised on a cluster of fountains and flanked by a 700-foot triangular shaft. This great white ball, called the Perisphere, will rise eighteen stories above the ground and will be broader than a city block. Except for the tower, it will be the fair’s highest structure and will house the key exhibit, a spectacular portrayal of the world of tomorrow. An endless stream of humanity will flow into the Perisphere night and day by way of a glass-enclosed moving stairway, the world’s longest. From the top of this flight, five stories above the ground, visitors will step on a “magic carpet” or circular moving platform for their journey into the world of the future. 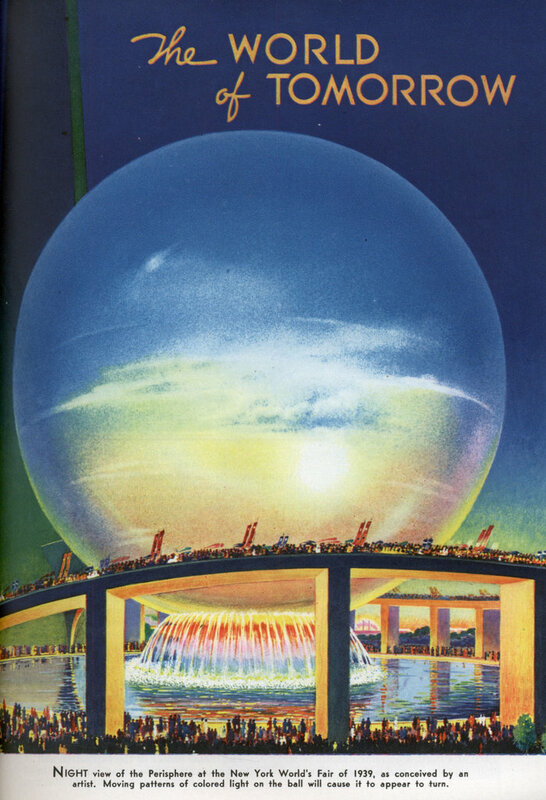 As this platform, fourteen feet wide, 450 feet in circumference and carrying 1,200 passengers, moves slowly around the sphere, the crowds will gaze down on a vast panorama showing cities and towns, factories and farms and fields stretching off to the horizon on all sides and blending into the clouds and light patterns of the dome. Here will be shown all the elements of society linked together for the common good. Ships and trains and trucks will be observed bringing raw materials from farms and fields to cities and factories, and carrying manufactured products back to the country. A voice will explain the significance of all this movement, stressing the fact that each person today is dependent for his existence on the efforts of many other persons and pointing out how the problems of living have been simplified by cooperation. Prom the exit, visitors will cross a bridge linking Perisphere and tower, descending a stairway inside the shaft or walking down a 900-foot “helicline” or ramp winding around the fountain basin beneath the sphere. The top of this helicline, fifty feet above the ground, will be the highest point to which visitors will be admitted and will command a view of the entire fair. Spectacular illumination will make the globe an awe-inspiring sight at night. Batteries of projectors will spot the sphere in color and other projectors will superimpose moving patterns of light on the ball, creating the illusion that it is a glowing, almost transparent bubble of changing color rotating lazily atop supporting clusters of spouting fountains. Actually, the Perisphere, of articulated steel frame construction with a light outer covering and weighing more than 9,000,000 pounds, will be supported on eight sturdy columns but spectators will not see them because they will be encased in glass and water will be pumped up around them, making it appear that the bubble is held up by the rush of water. The shaft, christened the Trylon, half again as tall as the Washington monument, will have a triangular base of sixty-three feet on each side and will serve as a fair guidepost since it will be visible for miles. It also will be a steel frame with a light covering and, while it has not been planned to use it for observation purposes, there will be space for installing elevators. The Trylon is not to be illuminated at night, except for reflected light, but will serve as the source of fair broadcasts. From it the ” voice of the fair” will issue announcements over a new type of long range sound projector which will make it possible to blanket the entire grounds with beams of sound, thus eliminating overlapping and unpleasant variations in volume. Water, flame, color and sound in almost incredible proportions are to be combined in providing two nightly spectacles expected to rival in sheer size and grandeur anything ever conceived by man for entertainment alone. One spectacle will feature the play of super-fountains and super-flames, synchronized with color effects, music and sound. The other will be a man-made Niagara plus a man-made Vesuvius, an approach to chaos. Hydraulic engineers, gas-company chemists, fireworks manufacturers, illumination experts, musicians, display engineers, architects, color specialists and artists collaborated in planning these two displays which require installations costing $700,000 and which are on so large a scale that two gas companies have united their resources to assure enough fuel. The controls for these spectacles have been planned so carefully that a composition in water, flame, color and sound can be “played” from a central board much as one would render some great work on a pipe organ. At the touch of one control, a thousand fountain jets, some 150 feet high, can be made to spring from invisible sources, or towers of flame equally high can be produced to combine with the uprushing water in a furious battle of the two elements. Then, at the height of this display, all valves can be closed so quickly that fifty tons of water will seem to hang suspended in midair. The apparent color of the water and the actual color of the fire can be controlled as easily, and the strains of a violin or music as tremendous as thunder can be produced from the very heart of the spectacular turmoil. One spectacle will be presented from an 800-foot lagoon in the main exhibit area, the other from a lake in the amusement zone. The lagoon display will require 1,000 water nozzles and many twenty-four-inch gas burners of the Bun-sen type. Water nozzles will be grouped to produce the 150-foot columns, and one circle of jets which will produce a sheaf of golden wheat ninety feet high will require as much pumping force as would be exerted by sixty-two fire pumpers. For the lagoon display, the many circles and patterns of nozzles, gas burners, fireworks receptacles and other equipment will be installed on a block-long platform beneath the surface of the lagoon. Two or three men will operate the show from a control room atop a near-by building. Because of the problems involved in amplifying music to a point where it can be heard above the rush of water, special musical scores must be prepared for the show. The amusement zone spectacle will present an inferno of water, fire and color and will be staged from barges. There will be flame and water-throwing barges while light barges will bear searchlights, mercury vapor lamps and sodium floodlights, and fireworks barges will touch off the pyrotechnic displays. Others will launch silhouettes of gondolas so spectators will have a yardstick to judge the tremendous-ness of the scene. Captive balloons, played upon by searchlights, will provide the “ceiling” for the show. The fair’s most elaborate and costly artistic project will be a $60,000,000, mile-long Central Mall extending like a jeweled band across the main exhibit area. This Mall will be bordered by more than a score of the largest buildings, studded with heroic sculptures, inlaid with lagoons, enlivened by waterfalls and hundreds of fountains, accentuated by huge pylons and lined with more than 1,000 trees. Dominating one section will be the largest portrait statue fashioned by man since the Egyptians hewed the figure of Ram-eses II out of rockâ€”a sixty-five-foot figure of Washington as he appeared for his inauguration. Other huge figures, majestic murals and massive reliefs will adorn this area, as will a fifty-foot sun dial which will actually indicate time. Not a light bulb or other visible source of illumination will be seen at night along the main section of the Mall. Instead, mercury vapor lights sunk in the ground will cast a soft glow into trees and foliage, causing the under sides of leaves to fluoresce and bathe the entire area in a luminous radiance, seemingly emanating from the trees, shrubbery and flowers. Each exhibit zone will have its own key display, a spectacular “summary” of the kind of exhibits in that area. In the transportation building, for example, the focal exhibit will include an intricate working model of an interplanetary rocketport of the future. Here visitors will see futuristic ships, planes and trains unloading passengers for a trip to Mars. Then, as motors hum, signal lights twinkle and sirens scream, will come the breath-taking moment of departure. A crane picks up the rocketship and deposits it gently in the breach of a rocketgun. There is a brilliant flash, a muffled explosion and spectators see the rocket winging its way through the heavens. One of the largest exposition buildings ever constructed, a modernistic S-shaped structure nearly one-fourth mile long, will house the most elaborate railroad exhibit ever assembled under one roof. Among the features will be the largest working model railroad ever built, an outdoor train display and a pageant of transportation. In many cases, the design of a building will indicate the nature of its exhibits. A gas company building will be shaped like a huge burner, marine exhibits will be displayed in a structure whose entrance will resemble a waterfront pier flanked by the towering prows of two ocean liners, and aviation progress will be shown in a building representing a colossal plane emerging from its hangar. 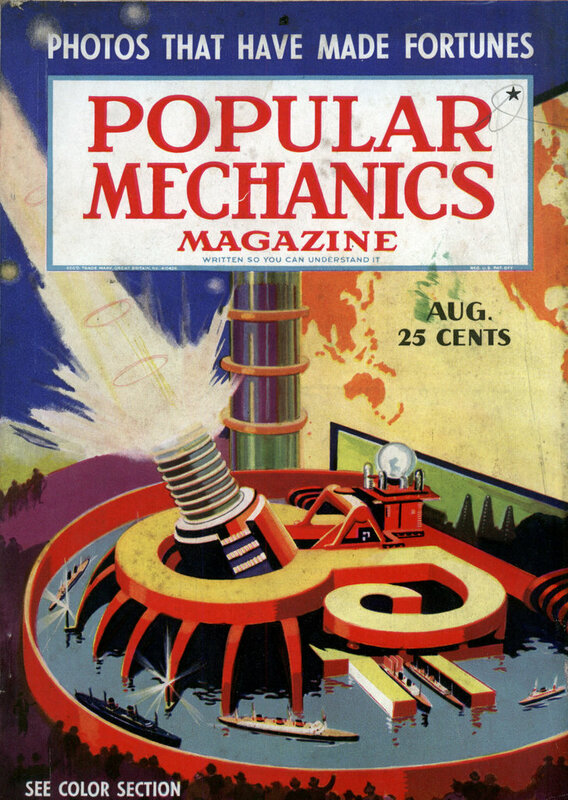 Television will be demonstrated in the RCA building which will be linked directly with the NBC television transmitter atop the Empire State building, and the government’s $3,000,000 exhibit section will include nine large, semi-classic buildings dominated by an imposing federal structure. One feature will be great revolving murals, each of which will tell a story of government activity as it moves along the walls. One of the outstanding features will be a $1,500,000 “Town of Tomorrow,” an advanced concept of community design and housing featuring new architectural treatment and the practical use of all modern house building materials, methods and equipment, together with suggestions for home decoration. When a Gothamite starts reeling off fair facts and figures, he sounds like an astronomer discussing distances between planets, for some of the figures are so staggering as to make even New Yorkers a bit dizzy. “We’re going to set out 1,500,000 shrubs, 10,000 trees, grow 250 acres of grass, plant millions of flowers,” he begins casually, then shifts into high. “Fifteen million square feet of walls will enclose fair buildings which will be stabilized by 308 miles of pilings. Into these buildings will go 15,000,000 board feet of lumber, 28,500 tons of steel, 400,000 barrels of cement, 9,000 tons of lighting materials and 12,000 tons of plaster board. To the seasoned fair-goer, all this probably sounds like sore feet. But this fair, despite its vast proportions, expects to have fewer aching feet per acre than any previous exposition. This is because it is being zoned like a city and related exhibits will be grouped so visitors interested in any particular subject will find everything relating to it in the same general area. The site is shaped like an airplane and exhibits will be concentrated in the 390-acre cabin section, amusements in the 280-acre fuselage, a boat basin and docks will form the propeller, and the motor and tail will form parking space for 35,000 cars. Watch out for the giant robots, Sky Captain!